The effects of allergies can be a hugely frustrating and irritating problem, especially during spring and summer, when the symptoms of hay fever reach a high. Fortunately, there are things that you can do from the comfort of your own home to fend off allergy attacks. Keep reading to discover the top five home remedies for easing and preventing symptoms of allergies. One of the worst things about being allergic to pollen in the air is that it can stick to your hair and clothing, making the symptoms persist even after you have retired indoors. Make sure you wash your hair as well as your body - which can also collect pollen - every evening instead of in the mornings. This will get rid of all the pollen that could fall onto your face, and will prevent the pollen reaching your pillow. Rinsing your eyes with water can help to relieve itchiness too. 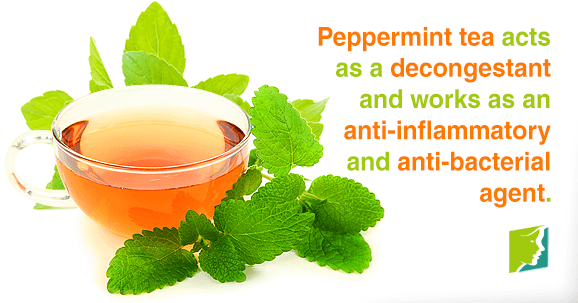 Another one of the best natural remedies for helping to relieve symptoms of allergies is drinking peppermint tea. The oil found in it acts as a decongestant, and it also contains properties that work as anti-inflammatory and anti-bacterial agents. If you feel like it is too hot outside for tea, boil it and let it cool before enjoying it iced. Steam is one remedy that has a two-pronged method of helping to relieve allergies. Boil some water and hold a towel over your head before inhaling the steam. The steam will help to sooth your sinuses and also relieve the nasal passages of mucus. Continue breathing the steam in for 5 to 10 minutes. Instead of pouring the hot water away after this, soak a cloth in it and hold it to your sinuses to provide them with further relief. Spicy food is one of the more fiery remedies available for relieving the effects of allergies. Hot foods, especially garlic and wasabi, have a decongestant effect, contributing to clearing your sinuses. However, it is still uncertain whether this helps in the long term or if it just provides fleeting temporary relief. Probiotics are an allergy remedy that can help to promote the overall health of your body. Good bacteria can benefit the digestive system, which can in turn help the body make better use of good food, and promote wellness and healing. Allergies are a common problem, and their symptoms can be frustrating and irritating. However, there are ways to treat allergies that don't involve reaching for the medical cabinet. By using these five home remedies you can relieve suffering naturally, reducing the frequency and intensity of allergy flare ups.